Ships from and sold by PureBreeze. Sold by Mat Board Center and ships from Amazon Fulfillment. 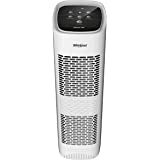 The Whirlpool&reg; Whispure&trade; AP250 True HEPA Air Purifier ‐ Model AP25030K, cleans air better than many purifiers twice its size. We've tested many air cleaners, and always try to offer our customers the best. This is it. The Whispure 250's AHAM Certified&sup1; clean air delivery rate (CADR) means you can be assured the Whispure 250 delivers certifiably clean air in rooms up to 320 square feet. Plus, its Energy Star&reg; efficiency translates into more energy savings for you. While the price might be for those watching their pennies, you would need to pay more than double the price to match the cleaning power of the Whispure 250. The Whispure 250 blends Whirlpool's expertise in home appliances with True HEPA filtration and sound-reducing technology. 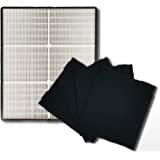 The True HEPA filter removes 99.97% of particles to 0.3 microns, with less air flow resistance to reduce noise, and less power consumption to lower energy bills. 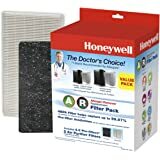 The activated charcoal pre-filter further removes odors and gases to keep air fresh while protecting the life of the HEPA. The Whispure 250 features 3 fan settings to purify air&hellip;and to control noise levels. The unit runs ultra quietly on low and medium settings. Although a bit louder on high, the Whispure 250 isn't even half as loud as comparable brands, and is Whirlpool's quietest Whispure model at the high setting. Designed to blend inconspicuously into your home d&eacute;cor, the Whispure 250 works anywhere, even against a wall. The unit's modest but good-looking control panel is loved by customers wanting attractive simplicity. Intelligently designed with a large open face for air intake and top air output for maximum delivery of filtered air, you will be amazed at just how much clean air the Whispure 250 produces. Filter maintenance is a breeze with the Whirlpool 250. Filter monitor lights conveniently signal the need for HEPA and pre-filter changes through the easily accessible front panel. 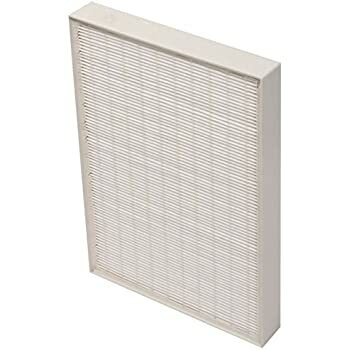 Under normal conditions, the pre-filter will need replacement every 3 months, and the HEPA filter once a year. 5-Year Mfr. Limited Warranty. 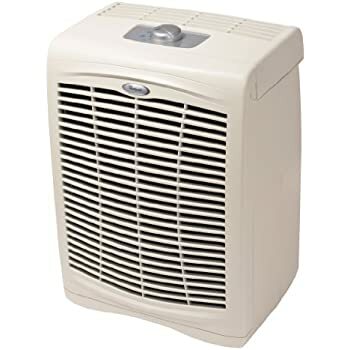 I used to use air purifiers just for the white noise factor until I recently had a plumbing disaster which required tons of drywall to be ripped out and created more dust than you can imagine. 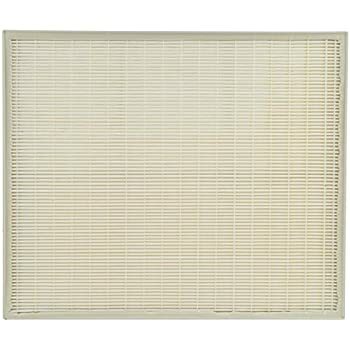 After renting industrial filters for several days, I ordered this for my bedroom. I opted for this one over the newer model because if the electricity goes out at night, the electronic version with all it's fancy buttons will not turn back on unless you get up and turn it back on yourself. I like the ease of the turn knob with three levels. I sleep with it on the middle level and it's the perfect amount of noise to block out neighborhood dogs. It does create some air movement out of the top and that tends to circulate air at a pretty high rate. If you don't like the feel of air moving around then you might not like this one. It doesn't feel like a ceiling fan, but you can detect some air movement. I researched every medium/large machine for about a month before deciding on this one. It is definitely big but if you need it for more than just noise, I think it does the trick. In addition to the relief I have had from the medical problems mentioned in the title of my review, I wish you to know, I am a person with keen hearing who hates noise and loves peace and "quiet." It's the way I live. 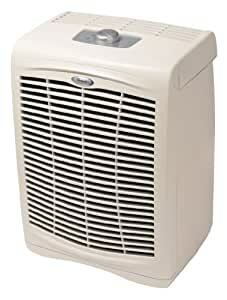 I have owned the larger Whirlpool Whispure "510" for a year and have loved it. 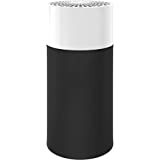 It cleans the air and relieves all my symptoms from ingesting secondhand smoke from a downstairs neighbor as this smoke travels through floors all year, and opened windows or doors in the spring/summer and after 6 years, this nonsmoker came down with mild asthma. The 510 very quietly and effectively, removes anything in the air in my living room/kitchen area. Anytime I walk into these rooms when the unit has not been on, my symptoms--wheezing, coughing, sneezing, runny nose, etc.,---all clears up within 1 to 3 minutes after turning the unit on. It's like magic! I love the way it helps me. And I can speak only for myself. Soooo, since asthma symptoms can arise very quickly when lying down, at night, I used to use an inhaler in order to breathe, but the medicine it contains, causes insomnia, as it is a steroid. I dreaded having my asthma symptoms several months a year, as I needed to sleep and didn't want to be on anything that prevented that, or should I misplace it, not having it available when needed and not being able to breath. That could lead to an early demise. I decided to purchase the smaller Whirlpool Whispure "450" unit for my bedroom and presto, so far any symptoms that have started are immediately gone after just a few short minutes, with my unit on. I have begun turning it on about 20 minutes before going to bed in my 250 sq.foot bedroom that needs windows open all spring and summer. This is the coast and seldom does anything have air conditioning, as it is rarely needed. I chose the 450 unit over the 250 unit as these units run efficiently, and it is rated to prevent smoke; the hardest substance for a purifier to get rid of and for a good CADR rating, one needs to run them on "HIGH." Well, the 250 units are quite loud ( for me )on high, as my neighbor has one and I have heard it. 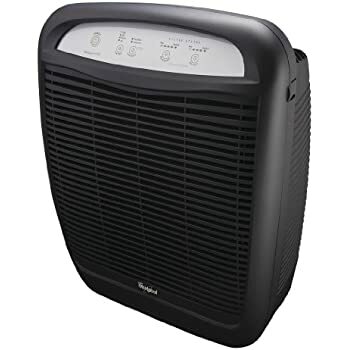 Also the 450 is rated for reducing smoke,and the 250 isn't, and having this larger unit in a smaller room, I don't have to run it on high, and just use the lowest setting, which is so quiet, it is actually soothing if even noticed. 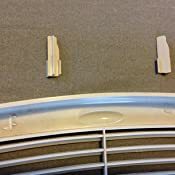 These units do blow the clean air straight UP into the room and I have found this circulates the air enough in a room that I don't even need a fan. They serve a dual purpose. Lovely! Wonderful! On medium the 450 sounds like a small window fan. The 250 sounds louder but still, too loud for me....the quiet-loving girl. I recommend the 450 for a small room, so it can be run effectively on low or even medium, without disturbing one's peace and quiet. Also, the 450 and the 510 use the same size carbon pre-filters which is a plus when buying a 4-pack, which as of yet, I have not needed. They run a long time...*smile*....depending upon how often they are in use. I use one unit at a time and on low. I don't run them all day unless a window or door is open. No need to, I have found. 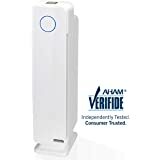 Over the past few years, I have used 3 other brands of air purifiers and none of them eliminated secondhand smoke and they were an expensive pain, to maintain and with frequency. The Whirlpool Whispures are the best on the market, in my opinion, and for my needs. 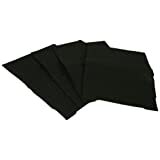 I also have a cat and also it can be quite dusty in the house I keep so clean, but dust appears much more infrequently, now that I am covered with these great purifiers. I have spent hours researching all purifiers and find that these models are often mentioned and recommended by rating experts and consumers in general. Two cons on these units: the electrical cord could be longer and it would be nice if they were on casters. As far as the color, they are a neutral ivory and rarely even noticed as they don't stand out, with my colorful 19th century museum decor. They don't distract from all the artworks. Nice! Thank you Whirlpool and thank you Amazon! You are each great companies to do business with. Here's to clear passages and a great night's sleep. Real fresh air. So happy! 4.0 out of 5 starsAir filter. This product was shipped fast in a timely manner. Came undammaged in good packaging. 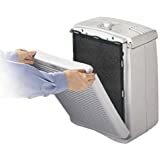 After extended use, I have found the product will indeed catch alot of animal dander and dust and will build up on the carbon filter until replaced or cleaned. Its a must to get a purifier with easy cleaning if you have animals after you see how much dander these will catch. I have found that even with a brand new filter and carbon screen the filter will dry out the air. Not sure if its this filter in particular that does this or all filters. But this model definetly drys out the air in any room its place in. Its pretty quiet on the first setting and can run for for hours. Settings 2 and 3 produce alot of noise. 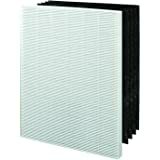 All good air filters are costly. 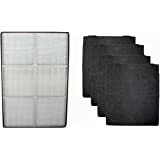 The replacement filters are costly as well. Having purchased about 20 such products over the last 15 years, I like this the best. You can spend lots more but you wont get better air. The key is to change the filters frequently enough. I double the carbon pre-filter to make the HEPA last longer. otherwise I would have to change it every 6 months. Hold the HEPA to a light, if you can not see the light through it, then toss it out for a new one. I also always get the big size so that I can run it on low speed to make it quieter. At higher speeds the noise is bothersome. They last about 4 years of continuous use. After that the fins break off of the fan and it starts to vibrate. Also, the front latch works poorly, so after about one year I use tape to hold it shut. I would rather have 4 of these then one of those high priced gadgets for $1,000. 5.0 out of 5 starsClean AIR! i bought one of these and could not be happier. 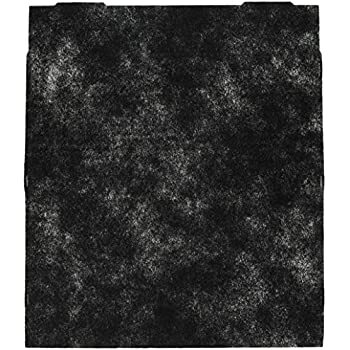 it removes smells from the house and there is a clear reduction in dust in the house. i have my first one in my living room. i love that it draws are in from the front and blows out the top. this allows it to go right up to a wall taking up less space. even at full speed it is very quite. i bought my second one for the basement. it use to have a slight musty smell. this killed that smell. update 8/2/2016: i bought this on September 28, 2010 and have been using it 24/7. i never turn it off except for filter replacement. absolutely zero issues thus far. The unit I bought in 2010 finally began showing issues. The motor bearing began making very noticeable noise just a few days ago. I decided to take it apart to see what might have been making the noise and once the motor was indeed the issue. I decided to stop using it. Almost 8 years of 99.9% continuous run time and it only now is showing issues. Not too bad in my opinion. Glad to see they still sell this exact model.